We hope you enjoy a 4 page photo montage of our Relief Rides in American Express' DEPARTURES Magazine's Russian edition. "A dental clinic in the final days, where we riders helped indian dentists treat hundreds of villagers was very rewarding. At the end of the day you felt you had actually accomplished something. All in all, an adventure hard to match!" We completed our 10th Relief Ride! A heartfelt thank you to all, without whom our work in India would not be possible. Your support and encouragement for the last 7 years has helped nurture what was just an idea in 2003 into a flourishing and meaningful experience for our Relief Riders, doctors, villagers and all those who follow and support our work. Our 9th and 10th Relief Rides gave us an opportunity to expand our 7 years of experience with fresh ideas from a new team and a beautiful region. These rides went so well that we are celebrating by expanding our reach and offering 3 Relief Rides in 2011. We hope you enjoy our new slideshow. It's a beautiful and vibrant visual account of this years Relief Rides captured by our Relief Riders. 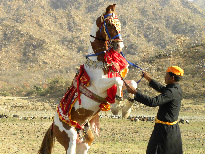 Our humanitarian missions were surrounded by days riding magnificent indigenous Marwari horses through a cinematic desert landscape and overnights in ancient forts and beautiful camps. 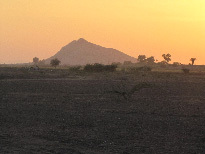 The vibrant terrain of southern Rajasthan offered us a wealth of varied experiences from sleeping in a serene desert oasis to joining villagers in a jubilant celebration of Holi- the festival of colors. 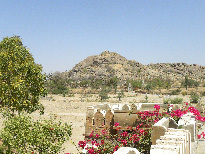 Woven between our relief missions, our journey through the desert of Southern Rajasthan offered riders unique travel opportunities. 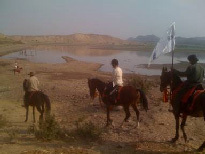 We rode through a moonscape terrain by moonlight, and by sunlight spotted from horseback indigenous wildlife such as black buck, desert foxes and Blue Bulls. This season saw the introduction of RRI’s Free Dental program which came together under the guidance of Dr. Mahesh Arora and Dr. Vivek Chaturvedi providing much needed dental treatments to 500 people in the villages of Nimaaj and Bordi. For many of our patients the free dental camp was the first time they had ever been treated by a dentist. Our pediatric program - always a highlight of our rides- took us to 11 rural schools giving us the opportunity to meet and treat 2,300 students. Our riders, uplifted by the warm and heartfelt welcome from the children were inspired by their curiosity and moved by this experience. We were able to distribute 43 goats to below poverty level families through our Give a Goat program. The brilliance of this experience lies in the sheer pandemonium created by an enthusiastic village crowd, a herd of goats, and a group of riders! This meaningful and useful experience is always deeply appreciated by our riders. I hope all of you have are having wonderful summer. "Every time you recognize a potential within yourself, the universe reacts by creating an opportunity for it to be used."